This is a question often asked by producers whose aim is to monetize digital goods. Which model offers the best opportunity to maximise revenue while minimizing costs? There are many arguments proffered for both models, but what are the facts and what do you need to consider when you are making a decision regarding which model to adopt? We are going to look at the pros and cons of the two business models, together with the metrics you need to use to establish whether you are maximizing your digital content monetization. The analysis is based on the recent Vindicia report: “Best Practices for Online Business & Subscription Models” and a IHS’s report “Subscription Revenue Declines as Microtransactions Take Hold”. More and more we are used to paying for goods and services via a subscription model; paying a regular amount to access the goods that we want. The more people become used to this method of purchase, the more they are likely to embrace it as a means of obtaining access to digital content. Every subscription model is based on the same premise of a supplier making a regular charge for a product. The differences come with the type of access being provided, and the time frequencies over which subscriptions are paid. For instance, a provider may offer a freemium service whereby people can access a certain level of content free of charge, or choose to pay a subscription for premium content, and one provider may charge subscriptions on a monthly basis, whereas another may charge six-monthly. Obviously, no matter which business model you choose, you need metrics in place to measure performance. The most vital metrics for the subscription business model are the Average Customer Lifetime Value (ACLV) and the Monthly Recurring Revenue (MRR). The ACLV is the product of the average customer payments and the duration of the average length of time the customer opts in for (the customer lifetime). The MRR is the amount of revenue that is likely to be obtained each month, based on customer subscription rates and behaviours. The MMR should be relatively stable if you employ the subscription model. A more predictable revenue stream. Greater customer retention as they have to opt-out from subscription rather than opt-in to making random payments for content. A higher ACLV than for non-subscription services. Improved potential for upselling and cross selling. Potential burden of customer account management if it is not automated. Using payment options that require a great deal of customer interaction, which can be a deterrent. Potential subscription overload, according to Sony most people can only cope with up to seven subscriptions. This could reduce opt-in for your product. Potential loss of revenue from those who would purchase a large amount of content, such as dedicated gamers. Subscription is the overarching business model, within which there are three submodels; frequent, infrequent and freemium. Each of these submodels comes with its own considerations. This is a widely accepted submodel whereby customers pay regular subscriptions, most often on a weekly or monthly basis. It benefits from being a model which most readily lends itself to the smooth transition from a free trial requiring payment details, to regular subscription. If you adopt this submodel, customers pay on a less regular basis, generally on a six monthly or annual basis. There is less work required around customer account maintenance but you run the risk of customers being more likely to have changed their payment details by the time the subscription is due. You also have less interaction with the customer so it is more likely that you will not be aware of any potential customer dissatisfaction. This is a new and increasingly popular submodel, which eliminates the need for free trials as the model involves merely moving from free access to premium access at the request of the customer. One of the major issues with freemium is the requirement for careful monitoring of what is available in the different packages, and the need to continually track conversion rates. This model is mostly popular in the gaming world (especially in Asia where it originated) and for events that are streamed online. It allows the customer to purchase content on an ongoing basis, when they see fit, for a small transaction cost, which is usually less than $10. This model has not gained as much popularity as it could have, due to the high transaction costs involved, when compared to subscription; approximately 7% of the purchase price as opposed to 3%. It is possible to aggregate charges as iTunes do, but the limited amount of successful transactions rarely makes up for the increased costs. For this model the most important metrics are Average Revenue Per User (ARPU) and Average Revenue Per Paying User (ARPPU). The former measures the average revenue for an individual user for all of the users of the service or product, while the latter measures the average revenue for an individual user for all paying users of the service or product. There is usually a wide variation in the ARPUs for successful F2P gaming models and the ARPPU for subscription games, with the aim that the shortfall should be made up by the higher number of users. Buy-in from those who cannot afford regular subscription. Full benefit of profits from those who would possibly spend upwards of $1,000 per month on gaming. Customers attracted by being able to purchase content when they want to. High associated transaction costs potentially limiting profits. Lack of customer loyalty that exists with subscription which can lead to lower revenue levels. Analyzing the gaming and eSports sector, there is a significant shift in revenue model patterns, moving away from subscriptions and toward micro-transactions. 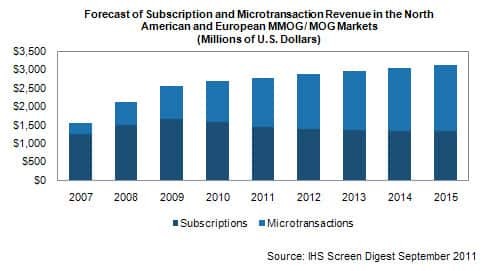 Subscriber revenue in the combined markets for PC massively multiplayer online games (MMOGs) and non-massive multiplayer online games (MOGs) in North America and Europe is expected to grow to $3.13 billion until the end of this year. So which is the best business model? We have provided you with information concerning the subscriptions model and the micro-transactions model. It’s clear to see that although initial buy-in for the micro-transactions model may be higher, due to lower customer cost, the regular revenue potential of the subscriptions model is far more stable. It’s still an individual decision, as to which model to opt for, but if you choose the micro-transactions model you are likely to be taking on greater financial risk, as opposed to the more easily measurable subscription model.